This selfie stick is compatible with most devices (including cameras and smartphones of various models). It is compatible with various models of iPhones (iPhone 6+, 6, 5S, 5, 4S,4) and Androids (Samsung Galaxy S5, S4, S3, Samsung Note 10.1, Google Nexus 4, 5, 7, 8). According to customer's feedback, it seems that it works really well even with other types of Android phones. The length of the phone should be preferably be less than 13.1 cm (even if it is longer it is fine because the phone holder has one open end) while the width of the phone can go up to 8.5 cm. The setback (which is why the rating is 8/10) of this selfie stick is that the supplier does not officially test the compatibility of this device with other phones (excluding those stated in first paragraph). Precaution: Just make sure that your phone's bluetooth system can be paired easily with other devices and ensure that the thickness of your phone does not exit 12.0 mm, then it should be fine. You might need to remove your phone's cover if the cover is too thick (or change to a thinner one). This selfie stick comes with some great features to improve your selfie experience. Extendable selfie stick - An extendable stick up to 2.8 feet (excluding the handle and phone holder) extremely great for selfies. When not in used, it can be contracted to be brought around easily. Good quality handle - The handle is made of rubber pad which makes the stick less slippery. 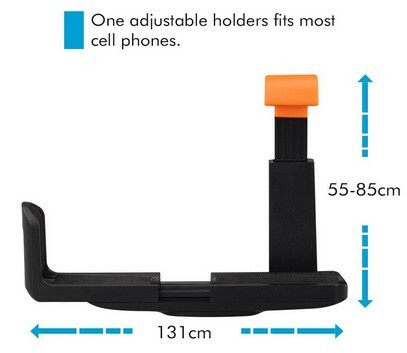 Great phone holder - The phone holder that comes together with this selfie stick is well designed such that there is one open end which allows it to accommodate more types of phones. Besides, it comes with an orange cushion which improves the stability of your phone as well as protecting it from scratches and over pressure. In-built Bluetooth System - This is a great feature that you wouldn't want to miss out when getting a selfie stick. It allows you to pair your phone with the selfie stick. In other words, you can now take selfies with just a click on the button on the stick. Precaution: There are two customers complaining that the button is a little difficult to press which makes the selfie picture blur. This is a normal problem in most cases though, just want to warn you before getting it. Unfortunately, a safety string is not present in this product. It is a string that connected to the handle of the selfie stick which normally hang around your wrist. This string will save your phone when the selfie stick slipped off your hand. The durability of this product is not that good. There are a few cases where the sticks broke in a few days or so (this is normal as it happens in other products too). I would say that if you are using it frequently (everyday), then you should be considering one with a better quality. Note: The stick might bend a little if an iPhone 6+ is used while the stick is extended to it's maximum length (according to some customer's review). None reported that the stick broke because of this reason, but it is logical that the stick might break soon (looking that it bends). Having all these said, the durability of this product is actually considered much better to other low quality sticks. This product has an average rating of 4.5 stars in Amazon. However, due to the fact that it is a newly released product, most of the ratings are bought (the supplier pay people to create good reviews about the product to build trust, giving confidence for customers to make their purchase). Based on the customer's review and the product quality, I would say that the rating should resolve around 4 stars which is 8/10. Many of them are happy for the service the product provide when compared to it's price. I would say customer's support for this product is great. If you leave any unsatisfied review/comment at their product review page, they will be coming back to you in no time. This is great because we know that they are there for us. Also, this product comes with a one year warranty period (it seems they are confident with their product). What I don't really like is that they ask you to email their support team for further advise, I would prefer calling as it makes the process faster. Having that said, emailing is convenient too especially if you are from other continents. This selfie stick only comes in one color which is black. Fortunately, the overall appearance of the product looks great (black handle with silver extendable stick and orange rubber. Due to this reason, this product still deserves a 3/10 rating for it's great look. It is easy to use this selfie stick (no complicated steps). Basically, you will just need to switch on the power of the selfie stick and then pair up both devices (the selfie stick and your phone) through bluetooth. These steps are really easy to follow as they also provide a complete manual together with their product. The stick is light and compact (only 0.77 feet when the stick is folded excluding the phone holder) which makes it easy to be brought along anywhere you go. You can carry it in your hand or keep it in your backpack, either way it shouldn't pose any problem. The setback. 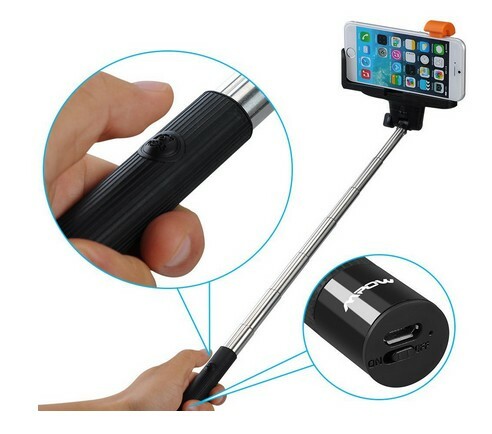 This selfie stick uses the bluetooth pairing system to work which is battery consuming (there are some in-built selfie sticks out there that they provide a cable to be connected to the ear phone hole of the phone which safes battery). Isn't that good for long traveling purposes. This product has a recommendation level of 4/5 (very recommended). Despite that there are some minor features missing,a few customers complaining that their stick broke and the lack of choices of colors, it is still a great product to go for. Is this product great? If yes, please consider sharing it our to your friends so they can enjoy what you had enjoyed. If no, please refer them to our Resource Center for more reviews! What else would you like to add on to our review? Please do us this favor (you only need 20 seconds) to help us improve your experience. In addition to onilne strangers, I also have friends/family and island locals who follow my blog. It’s a little strange to have all those worlds colliding. In some ways, it’s easier for me for the strangers to read my written insights rather than people who may be involved in my real life! So I found your comments about that interesting. As to your new-phase quest, of course that helps explain your recent slump! I’m very excited for you regarding your new projects and possibilities, and I look forward to seeing how it all unfolds!